What makes our writing great? Together we looked at 2 narrative texts. We decided that one was better than the other. Next we highlighted all the great parts we could find. Here's our winning players. We won 4-0. Great team performance! Lucy and Michelle brought Buddy to see us today! We remembered some great information Lucy had given us during an assembly last week then we had great group discussions about some statements. Fractions, with help from pieces of chocolate! 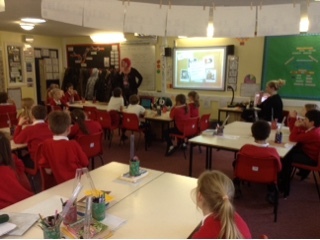 Our special visitors from the NSPCC/Childline helped us learn about child safety. This contributes to our understanding of Rights Respecting Schools (RRS) Award. This week's Challenge has been posted! The B team in football came a creditable joint second. The brand new Reading Challenge! Please would parents familiarise themselves with Boris the Bookworm and our Vocabulary Vulture. 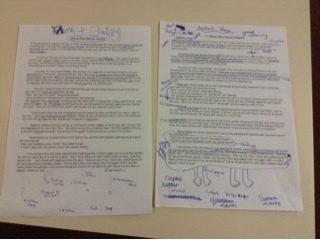 Details are outlined in their Reading Records. Have a chat with your child about this. Thank you. Here are the successful readers. Maths - look at our flipping reflections! Dylan shows how opposite poles of a magnet repel each other.